We awoke to a beautiful morning; sunny, fresh, a little frosty, but not quite as cold as it has been; just the weather we’d been hoping for, and perfect for our first walk of 2009. We hopped in the car and headed for Kearsney near Dover. Looking at the map we felt the best option for parking was Kearsney Abbey, which is happily well sign-posted, so we got there without a hitch. After changing into our boots and taking a few pics we set off towards Sherherdswell (about 10am). As seems to be all too often the case, the walk started with a long incline. I suppose at least it warmed us up and got our legs moving. We skirted the edge of some woods, following a good clear track most of the way. 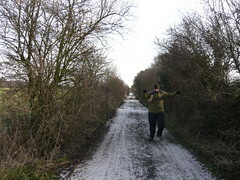 I skipped ahead to get a snap of Sid on the frosty path and managed to catch him just has he slipped – what timing! 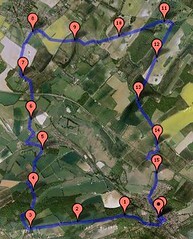 After a couple of miles we turned north, passing through fields and woods before descending briefly into Lydden. It was as we were leaving Lydden that we encountered some rather unusual sheep (in our experience anyway). Rather than running away, these sheep approached us persistently, we’re not sure whether it was friendliness, hunger or they were protecting their territory. Either way, we didn’t hang around long as all we had to offer was fruit. We ascended fairly steeply out of Lydden, skirted the edge of a rather awkward hole, and headed for the A2. On the way we passed over Lydden tunnel, housing the railway. There was something quite cool about knowing that somewhere far beneath us there might be a train, we also spotted the air shafts. Happily the A2 was easy to cross on a Sunday morning and just a mile later we reached our planned lunch stop; Shepherdswell (or Sibertswold?). Arriving outside the Bell at about 12:05pm we were devastated to see no signs of life despite the sign saying they opened at 12! Eager for food, we headed down the hill to the other pub in Shepherdswell, the Cricketers. However, it turns out they don’t serve food, so in desperation we picked up some provisions from the Co-op before heading back to the Bell for one last check. We were very happy to see it had opened in the mean-time so we headed in for our lunch. We’d planned on having a light lunch as we were having home-made curry for tea, but their Sunday menu was all big meals, oh well… Two roast beef dinners and a beer later we re-donned our muddy boots and headed back out into the sunshine. From Shepherdswell we joined the North Downs Way for a while, this was where the mud really began. Some of the fields we’d crossed thus far had been quite claggy, but in the second half of the walk the mud took on a whole new character. Due to the cold weather the ground everywhere was pretty hard underfoot, but thanks to the milder weather today, the frosty top layer had thawed to leave a slippy, slimy surface which made every step move underneath us and coated our boots in a very thick layer of “clag” so that they became incredibly heavy! The only highlight of this section was a mysterious tower near Waldershare Park, which really captured our attention, we just couldn’t figure out what it was! 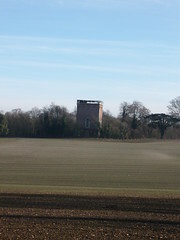 When we got home we did a spot of Googling and found out that it’s called the Belvedere tower, built in the 18th century for no particular purpose other than as a garden feature from which to admire the view (big feature!). After Walderhsare House we turned South to head back to Kearsney and were confronted by a sharp wind and more claggy fields. This section was really hard going and tiring thanks to the combination of wind (Sid’s least favurite weather) and mud. 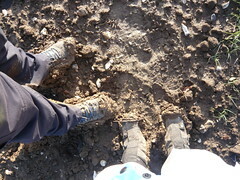 It was a great relief to reach Singledge Lane for a little easy road walking and to bash the mud off our boots! One more muddy field, then it was back across the A2 (or rather under it) to a steady descent into Kearsney by way of a pleasant woody path. We easily found our way back to the car and were very happy to remove our mucky boots and pop into the tea rooms for a nice hot drink (a very pretty and ornate tea rooms by the way!). Overall this was a very nice walk (despite the clag), which would be even lovelier on a spring or summers day. There were some nice views, a good variety of paths & surroundings, some points of interest and a couple of options for breaks (Lydden also had a couple of pubs). After walking in some of the most beautiful parts of the country we’ve been finding it a little difficult to start walking around Kent again. Although Kent is very beautiful in its own garden-like way it’s no Lake District. The problem with Kent is that it’s pretty flat. The scenery is great, the orchards, the historic buildings, the coastline, but it’s no match for the giants in the Lakes. So we continue our quest for the hilly part of Kent that we’re not just going to enjoy, we want the part that is going to stun us. And so we head for just north of Dover, a little place called Kearsney. The countryside round that way tends to be a little more undulous. When we stick in our own county we like to try and leave the car at home so when we got the maps out the first point we looked for was a train station. The plan initially was to plot a route along the coastline heading from Dover to Folkestone and then up into Elham into the valley up there. The problem with that though was the lack of train stations. So we changed our plans and now we are doing a circular walk that looks a little like a crisp packet from above. It’s just over 10miles so it’s not too long that it’ll knacker us but even so we’ve built in a possible train-based shortcut from Shepherdswell if we decide we’ve had enough at lunchtime. I’m hoping that the weather is going to be cold, cold, cold. I like the way the countryside looks when it’s all frosty. The weather report says it isn’t going to be but I bet we still enjoy it.